Ford is asking you to give Random Acts of Fusion a try. The automaker has enlisted Ryan Seacrest, Joel McHale, and Kate Micucci in a social consumer campaign to help fans experience the redesigned 2013 Fusion. In one of the first Random Acts of Fusion, Ford is giving you the opportunity to drive the sedan for a day while a film crew documents your adventure with the new Fusion. To enter the contest, visit http://randomactsoffusion.com. 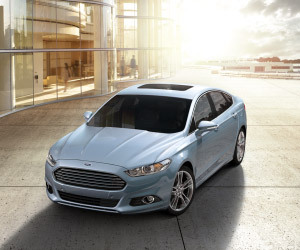 Next, describe the adventure, including your destination, you would take with the 2013 Fusion in 300 characters or less. A judging panel will consider the sentimental value, humor, thoughtfulness, and creativity of each adventure and select five winners. If you win, you get to select one guest to fly with you to your destination for three days and four nights. On one of those days, you will get to drive the 2013 around while being filmed. Ford will then edit the footage from each of the five winners into one documentary. The contest ends September 17, 2012. Another Random Act of Fusion includes placing 100 Fusions at various locations in the U.S. throughout the summer. The cars will be hidden, and finding one will result in a prize, such as free coffee and food. More events and activities can be found on the Random Acts of Fusion website.